Funded by an Indiegogo campaign, the first ever Iranian Western portrays the Iranian ghost-town Bad City, a place that reeks of death and loneliness, and where the townspeople are unaware they are being stalked by a lonesome vampire. 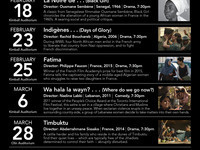 A series of films from Africa and the Middle East will be available for public viewing. Small introductions from faculty members will precede the film showing.